The most engaging stories often capture where you are, who you're with, and a photo to show what happened. 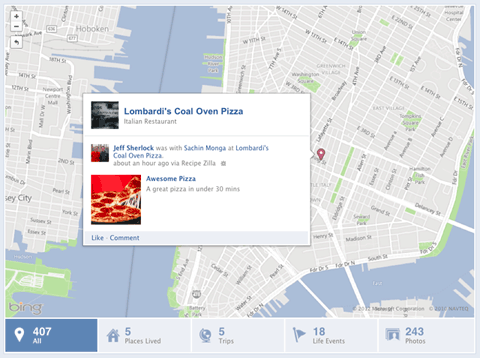 Today we’re introducing several improvements to the Facebook Platform that allow people to do all of the things they can do in a status update &ndash; including add friends and location &ndash; directly from the apps they’re using. For example, an app used to share your favorite meals can now make it possible to add where you ate and who you were with. These features give developers the tools to build more robust apps that help people to fill out their timelines with more detailed moments. Starting today, location and friends can be added as properties to any photo, link, or status written from an app. This is similar to the functionality a user has when they add a photo or updates their status. We have added familiar controls for managing tags. New users select the audience they would like to share their app activity with in the app permissions dialog. Users can choose to feature, hide or route these stories for tag review. Many new apps have emerged in the past few years to give people a way to capture important moments through photos and videos. Developers working with the Open Graph can now build apps that display large user generated photos and playback video in news feed and timeline. We look forward to seeing the new experiences you will create with these features.